Matt, Chris and Dom are finding their festival preparations problematique... and are not aMused. Not content with having sold out Wembley Stadium - twice - and filling it with all manner of space paraphernalia (satellite dishes, weather balloon trapeze artists and men in radiation gear), Muse had their sights set on bringing a spaceship on stage for their headlining slot at the V Festival this weekend. Much to the band's annoyance, though, those killjoy Health and Safety people have stepped in and put a stop to the idea. "Health and Safety are as usual ruining it all," commented frontman Matt Bellamy. "We've redesigned the whole stage and we're bringing in loads of props that won't be on stage but around the venue". 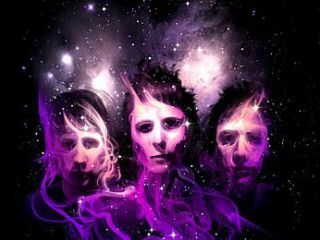 MusicRadar remembers a time when stadium rock bands were content with simply bringing a miniature Stonehenge model on stage with them, but the fact that Bellamy considers a spaceship merely a 'prop' shows just how astronomical Muse's live ambitions are. Presumably Matt wanted to bring in a few of Jupiter's moons too, but couldn't get insured. However, there's always the possibility that it wasn't a Health and Safety issue at all, but perhaps a case of brand protection. After all, Richard Branson can't have Muse going head-to-head with his Virgin Galactic consumer spaceflights. Had the band painted a large V on the side of the craft, they might have been alright. Spaceships aside, Muse's set is sure to be fantastic. V festival kicks of on 16th August.